p. 8, 9 Local News—Announcements—Engagements, Deaths, Meetings, Society news,, etc. This issue, published in Pittsburgh, PA on August 18, 1939, just two weeks before WWII began in Europe, is an interesting read, noting happenings in Europe as well as local news of Jewish interest. Below is a list of individuals who may have been Jewish. This Russian language resource is worth my mentioning again. There are 40+ cemeteries listed for viewing. Use an online translator as needed. 1. 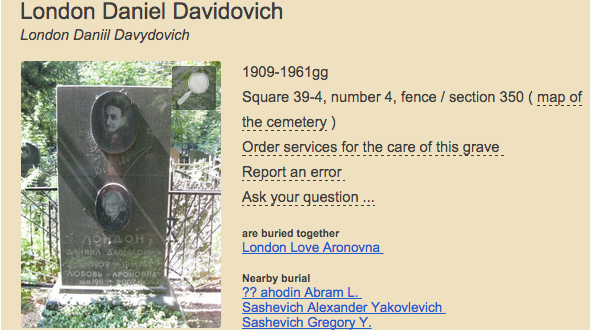 Clicking on the desired cemetery link brings you to photos of monuments with the names of those buried. Many monuments are in the Russian style imprinted with images of the individuals. 2. If you click on an individual’s name, sometimes there is additional information regarding others who are buried nearby or about those who are buried together. A table of individuals, Jews & non-Jews, which includes: an alphabetical list of names, dates & places of birth, professions. "1933-1945 THE MEMORIAL BOOK OF THE FEDERAL ARCHIVES FOR THE JEWISH VICTIMS OF NAZI REGIME Persecution UNDER THE IN GERMANY"
"It contains the name, personal information and destination paths from the current 159.972 people who lived between 1933 and 1945 in the German Reich and: because of Their real or supposed Jewish origin or religion werewolf victims of Nazi persecution." The site is in German-There is an "English" language button on the top right or use of online translator as needed. A search directory is available with various search fields. Antmann Moses, Birenbaum Sara, Brum Lajzer, ice Judah Berl, Eis Necha, Dyer Malka, Freinkel Henry Friedman Sarah Goldberg Cecily, Goldberg Hilda Anna Goldberg Moritz, Hermann Chaya Dove (b. Heilmann), Kimmelmann Isaac Issio, Kirschner Abraham Adolf, Krieser Loebl Leibish, Loffelholz Aron / Aharon Moshe / Moses / Mojzesz / Moritz, Nudeltrager Charlotte, Perel Judko Leo, Rogowski Yudel, Rubinstein Samuel, Black Moses / Mojzesz body, Seeman Feiwel / Fajwel Fab., Stark Beniamin). In addition to being born in Germany, so many were also born in Russia, Ukraine, and Galicia and do appear on this site. For women, maiden names are given when known. 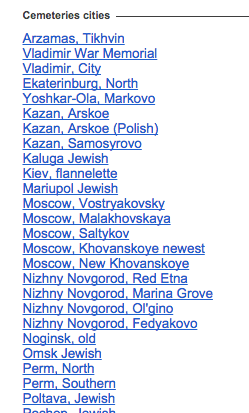 Examples Of Those born in Kherson are below. Please visit the site for additional data. 8/1941 Deported to Lodz Gh. 8/1942 Deported from Stutt. To Theresienstadt Ghet. 11/29/1941 to Riga Riga Ghet-Junfernhof outdoor camp.